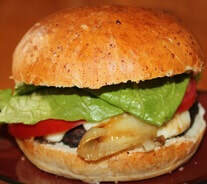 Going meatless is easy with these delicious vegetarian mushroom burgers. Use any leftover marinade as a condiment to brush on your burger buns. Heat large saute pan, add olive oil. Saute onions over medium low heat, stirring as needed for about 30 minutes. While onions are caramelizing, mix garlic, vinegar, oil and basil in small bowl. Baste mushroom caps with marinade. Grill mushrooms about 5-6 minutes. Turn mushrooms over basting with marinade again. Grill another 5-6 minutes. Top with cheese during the last minute of grilling. If you don't have access to a grill you can broil the mushroom caps. Place a rack on top of a cookie sheet. Place the mushroom caps on the rack and follow the directions above.